While the month's selection of six free games is the main highlight for PlayStation Plus members, they aren't the only thing that subscribers are entitled to right now. An additional freebie has just come online for anyone with a PS Plus membership. As announced last month, Plus members can now pick up a free DLC pack for Dreadnought, which is currently in open beta for all PS4 owners. The Dreadnought Plus Pack, as it's called, contains exclusive Ravenswood-themed customizations items. 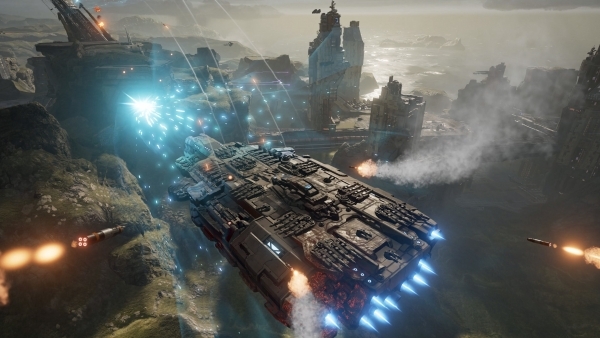 Dreadnought is a competitive action game where players take control of huge spaceships. It's a free download on PS4, and everyone--PS Plus member or not--can grab a ship, the Hactar Hero, for free on the PlayStation Store. We don't know how long the Plus Pack will be available for, so you should grab it now if you're interested. Sony has made a habit of offering DLC for free-to-play games to PS Plus members in recent months. Some older packs, like those for DC Universe Online and War Thunder, remain available on PSN.